Caramel Crispix Mix is so good, you'll have a hard time stopping yourself from snacking on it! 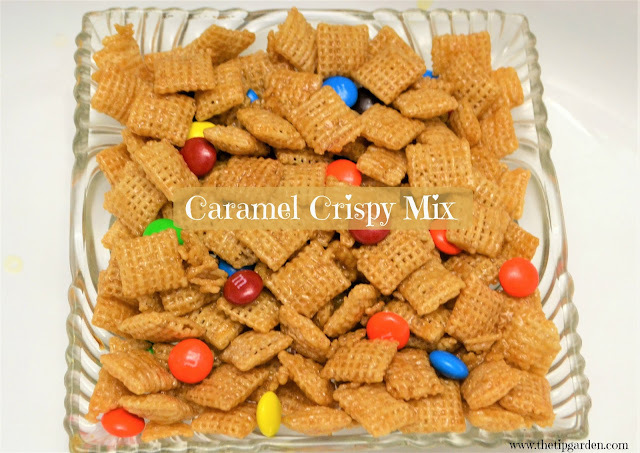 It makes for a perfect holiday treat, party treat, movie snack, or just because treat. You may even become famous for it in your own family! I got this recipe from my good friend Val over at Corn Bean Pigs and Kids. She is a busy Wife, Mother, and Farmer, and sharing good food and helping others turning them into traditions is something she loves to do, and this one will become your new tradition! If you don't already follow her, You should! I love when we get to Chat live with her from her "tractor" during harvest, or taste test the latest crazy Lay's chips flavors together! She is so fun! and great "farm" recipes to boot! I love that you don't need a candy thermometer or any fancy equipment to make this! Just follow the steps, a few minutes over the stove and then a few steps in the microwave! Easy Peazy! Mix in's: Have fun choosing your additonal add-ins: M & M's, Candy corns, peanuts or cashews, the sky is the limit, it's totally up to you! Whether you make these in to treat bags for gifts, or serve this up for a party, I promise everyone will be coming back for more! Your choice of Mix-ins: M&M's, Peanuts,Candy Corns, etc. Combine brown sugar, butter and corn syrup in pot and heat until boiling. Let boil for 30 seconds. Add baking soda adn stir until foamy. Pour mixture over cereal in large microwave safe bowl. Mix to coat squares. Microwave on high for 1 minute. Stir to evenly coat. Repeat 3 times. Once cool, stir in your choice of mix in's. Enjoy!.. Don't nibble now.. cause then you're hooked!.. I' warned you!